Please be patient! My computer has had a malfunction and I have been without a computer for three (!!!!) days! I am currently at the library using the computer so I will leave you a quick post to let you know that I am still alive and quilting (...and knitting, tee hee!). Sue claimed her appliqued block last night and I will post her picture as soon as I have a computer at home again. Til next time, remember to value who you are and how special you are. Smile like you mean it--it makes people wonder what you are up to!!! I know, I know--I've left you all hanging and wondering who won! 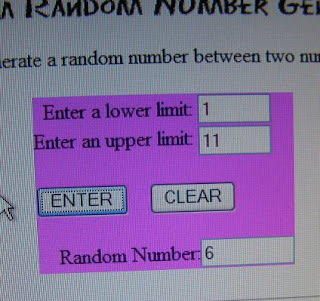 Using a Random Number Generator (the really fair way to do a drawing), I entered the starting and ending numbers and then hit ENTER. The lucky number was 6--Sue Radcliffe! Sue can email me or leave a message on this post to let me know if she would prefer an appliqued block, a hand pieced block or a machine pieced block. That's as much as she gets to specify! Here's a pic of the RNG so that you can see what it does. Coolest thing ever! With the drawing out of the way, I can catch you up on a few odds and ends. I was in Rochester, New York, the end of last week to do a class and a lecture. Great group of ladies at the Genesee Valley Quilters Guild. They were very welcoming and I had a great time with them. For those of you within driving distance or those passing through at the right time, their show will be held June 5-7 at the Rochester Institute of Technology. You can learn more at www.GeneseeQuiltFest.com. They are expecting about 500 quilts and 42 vendors. Check it out. If show and tell was any indication, it should be a spectacular show. We have been having snow here in the Finger Lakes. The other morning I looked out the kitchen window at the flag pole and wondered what was coiled on the pole. I could see all the rope--I finally figured out that it was snow! 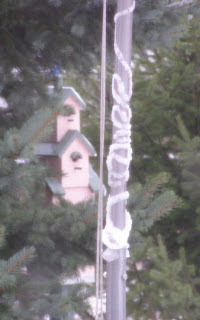 It had built up on one side of the pole and as the weather warmed it slid down and made this design! It's just amazing what Mother Nature thinks up--or in this case perhaps it was Old Man Winter! I have the Jeep back--it's always good to have something familiar around you as you speed around the country. I swear I spend as much time in the car as I do teaching. Well, that's about it for now. When Sue decides on her prize, I will photograph it and post it for all to see. Many thanks to all of you who did comment--made me wish for a prize for each of you. Til next time, remember to do something nice for yourself and to smile at those around you--it may be the only one they get today.